West Point has agreed to a two-year contract extension for football coach Rich Ellerson, who’s resurrected the program after a decade of misery. Terms of the extension, which keeps Ellerson under contract until 2015, have not been made public. This season Ellerson, in his season year with the team, has led the Cadets to their most successful season since 1996. They’ve won six games and qualified for a bowl — two things that past coaches Todd Berry, Bobby Ross and Stan Brock never came close to accomplishing. At 6-5, Army still has a shot at finishing with a winning season. But they’ll have to beat Navy this Saturday or beat SMU in the Armed Forces Bowl to guarantee that happens. 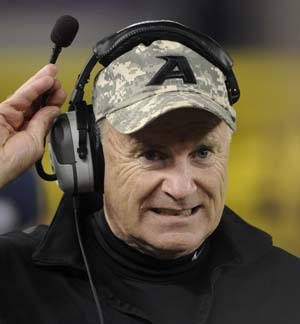 And if Ellerson can win either of those games, he’ll be the first Army coach to win 12 games in his first two seasons since Tom Cahill did it back in 1966 and 1967.